Every online business or an affiliate marketing campaign needs an autoresponder. An autoresponder is a software program that allows people to send automated emails. These are programs that are designed to cope with various situations. A prime example of how an email autoresponder works would be the delivery of a digital product the moment a customer makes a purchase. Another example would be a website visitor providing his email to receive emails from the website owner and getting an immediate mail in his inbox containing some message. The simplest way an autoresponder software program can be used is to send automatic emails back to an individual who has sent an email to the user. No individual can stay with his computer or inbox at all times. The autoresponder program is designed to deal with the interest from website visitors and emails when the user is not available. Our email autoresponder is, hence, a software program that sends automated emails on the basis of various conditions. The working principle behind our email autoresponder software program is to give online entrepreneurs and affiliate marketers the surety that potential leads would be taken care of even when they are not available to do it themselves. The autoresponder, depending on the condition specified which could be anything from a potential customer providing his email address to a client sending an email, would recognize the condition specified and react with a predetermined action. 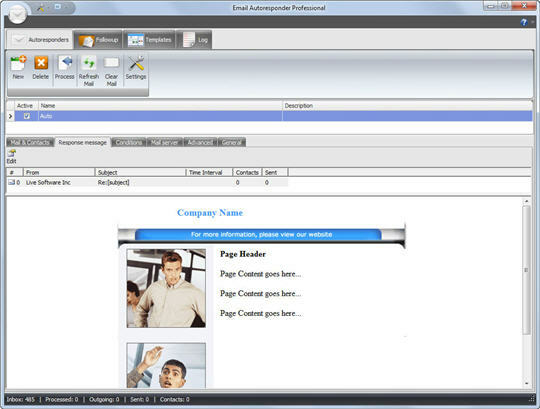 Autoresponder software programs are fairly simple in nature. There are many such software programs available in the market. However, the majority of such programs tend to be extremely basic. What sets our software program apart from its competition is the fact that it offers a wide variety of features over and above its core purpose. When you use our email autoresponder you will immediately notice that it is much more than an automated answering machine. This software would allow you to implement numerous other actions that would be pertinent to your ongoing campaign. Our autoresponder was designed to cater to every need an online entrepreneur, website administrator or affiliate marketer can have with regards to his online marketing and email marketing campaign. Our autoresponder includes a highly advanced contact lists management system which would resolve all your contacts’ organizational needs. For instance, you can import and export your emailing lists to third party formats such as Microsoft Outlook, Excel, MS SQL, Oracle, MySQL, Paradox, Foxpro, and Dbase. You can even use our autoresponder to set up, customize, and service multiple email accounts. What this means is that if you have multiple websites, emailing lists and email addresses you can use our autoresponder for all of them. In addition to this, if you are a kind of person who likes to keep a record of everything related to his business then you would find the log feature of our autoresponder perfect for your needs. Sometimes, it is important to set multiple conditions for the autoresponder to respond to. Some of these conditions could require specialized emails to be sent to potential leads and clients. This is why we have incorporated a state of the art HTML Editor with our email autoresponder software program. This HTML Editor would allow you to use everything from flash to personalized email messages. In fact, we have even paid attention to little details in our HTML Editor such as giving you the ability to use international characters. Two of the biggest problems that users face with their autoresponders are the creation of autoresponder loops and the problem of emails bouncing back. We are cognizant of the problems that autoresponder software users face on the ground level. This is why we have designed our autoresponder in such a way that it takes care of these two problems with aplomb. There is a very effective looping protection feature inbuilt into our autoresponder with a very convenient bouncing emails management system. We believe that it is the extra features that set apart an email autoresponder software program and this is why ours contains so many unique and effective features.